FREE CONSULTATION: Please contact our office to schedule a free dental consultation, which includes digital X-rays, (480) 493-0046. Afraid to visit the dentist? Do you wish you could feel more relaxed at your next appointment? Have you been putting off scheduling a dental appointment because you’re afraid of the dentist? Would you like to have complex dental treatment performed in just one easy visit, instead of splitting the work across multiple visits? Do you have a hard time getting dental work completed, because of a severe gag reflex or physical disability? During dental treatments, would you prefer something stronger than Novocain? Are you in pain or ashamed to smile, but have felt too anxious to call a dentist and make an appointment? If “yes” was your answer to any of the questions above, we can offer you a solution…sedation dentistry! If you, or someone you love, have been avoiding a trip to the dentist, we invite you to schedule a free consultation or a dental appointment. We’re looking forward to making your next dental visit a very pleasant one! For more information about our dental office, please call (480) 493-0046, or e-mail info@phoenixsedationdentistry.com. Please make note: Our dental office is in Mesa, near Falcon Field, just off Red Mountain Freeway (the 202). We accept most types of dental insurance and are in network, as a preferred provider for: Aetna, Cigna Dental, Delta Dental, Guardian, Humana, Metlife, United Concordia, United Health Care, and most other PPO plans. Below are some fast facts about sedation dentistry. Types Of Sedation: The three types of sedation for dentistry are nitrous oxide, oral sedation, and IV sedation. History Of Laughing Gas: Laughing gas (nitrous oxide) has been used in dentistry since the 1800s. Driving Home: You can drive yourself home after receiving laughing gas. But if you have oral sedation or IV sedation, you’ll need someone else to drive you home. Laughing Gas For Cleanings: To help you relax during your dental appointment, we can use laughing gas for dental cleanings, as well as other dental treatments and procedures. Benefits Of Sedation: The best benefit of sedation in dentistry is that it allows you to receive dental treatment, in a comfortable way, that lowers your anxiety. Trouble Getting Numb: If you have trouble getting numb, sedation can be an alternative to Novocain. 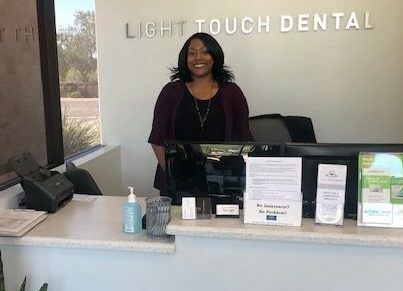 Sedation Dentists: Not all dentists in the Phoenix area offer sedation dentistry, and we’re one of the few dental offices to offer IV sedation, oral sedation, and nitrous oxide (laughing gas). Dental Anxiety: Dental anxiety and fear is far more common than you might think, which is why we’re pleased to be able to offer sedation as a solution. Pediatric Sedation Dentistry: For children who require sedation, we can use laughing gas for kids of all ages; we can use oral sedation for children who are twelve years or older. Sedation Covered By Insurance: Some forms of sedation, for certain types of procedure, are covered by dental insurance plans. Strong Gag Reflex: If you have a strong gag reflex, sedation can either relax you (laughing gas), make you less conscious of the procedure (oral sedation), or make you unconscious (IV sedation). Dental Health And Overall Health: It’s important to regain and maintain good dental health, because poor dental health has been tied to general health problems, such as strokes, heart problems, and diabetes.